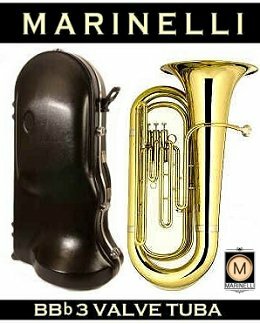 BBb Marinelli 3/4 Size 3 Valve Upright Tuba Description: Tuba Specs: 0.661 Bore Size, 15 Inch Large Upright Bell, Brass Body, Laquered Finish. Accessories: ABS Wheeled Hardshell Tuba Case, Tuba Mouthpiece, Low Brass Care and Maintenance Kit. This is a 3/4 size BBb tuba and is the most common size for adult students. We also include a 2 Year In-House Warranty with purchase. We offer several purchase options for this Tuba, Buy Now w Discount, Our EZ-3 Payment Plan or a Rent-To-Own plan. We can ship your Tuba anywhere in the continental USA! Click Here to Play a Tuba Sound Sample.